Apologists often claim arranged marriages produce wedded contentment, at least by the standards of their specific cultural contexts. One Sixteenth Century French noblewoman would beg to differ. Only tragedy and resentment will follow her forced union in Bertrand Tavernier’s The Princess of Montpensier (trailer here), which opens this Friday in New York. In love with the rakish Duc de Guise, Marie de Mézières is content with her promised marriage to his adoring brother, expecting it will allow their affair to continue unabated. Unfortunately, for reasons of money and prestige, her father accepts a better offer, marrying her off to the fiercer but less dashing Prince of Montpensier. With a religious civil war sweeping France, the Prince sends his reluctant new wife to his most secluded estate, leaving her in the charge of his former mentor, the Comte de Chabannes. A grizzled veteran wracked with guilt over the atrocities he has committed, Chabannes is now the Sixteenth Century equivalent of a conscientious objector. He is also a deserter according to the King’s law, so his liberty is entirely dependent of Montpensier’s protection. This puts him in an awkward position when he also falls in love with the Princess over the course of their lessons. It is not mutual though. The Princess still loves the Duc, making little effort to conceal her feelings from her husband. When the Princess also turns the head of the Duc d’Anju (the future King Henri III), his unwelcomed interest dramatically increases the stakes for her romantic intrigues. Tavernier and co-screenwriters Jean Cosmos and François-Olivier Rousseau radically reconceived Madame de La Fayette’s short novella, yet the two-plus hours never feel padded. Quite the contrary, Montpensier is a lean, muscular film, brimming with war and amour. Instead of a cautionary tale of a woman undone by yearning, their Princess becomes her own woman, though it costs her dearly. Mélanie Thierry shows tremendous range as the Princess, assuredly depicting her evolution from an innocent coquette to a wisdom-hardened woman mature beyond her years. Nevertheless, Lambert Wilson (recently seen in Xavier Beauvois’ mostly very good Of Gods and Men) truly personifies the soul of the film as Chabannes. It is not mere remorse or longing that he expresses, but something even more profound. He loves for love’s sake, while coming to terms with his contributions to the chaos and hatred roiling the era. 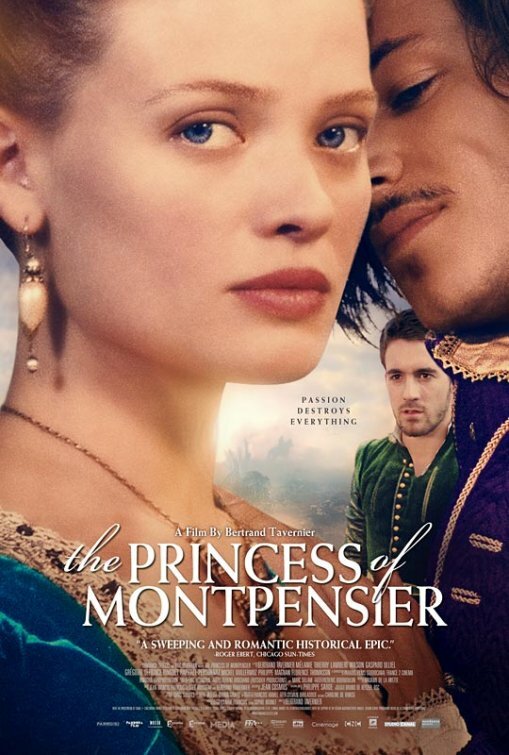 In a way, Montpensier is a familiar story of thwarted love, yet Tavernier spins his yarn into a big bold historical epic. His battle scenes are gritty and grimy, but he also deftly draws viewers into the characters’ web of mutual and unrequited passions. Once again, Tavernier’s film strikingly employs music. For obvious reasons, the Academy Award winning jazz of Round Midnight and the blues and Zydeco of In the Electric Mist would clash with the tenor of the time, but frequent collaborator Philippe Sarde’s stirring score incorporates chorale and string arrangements that evoke the period without slavishly mimicking its composers. Montpensier is the type of sweeping and sprawling epic that is a joy to dig into when done well. In this case, Tavernier’s execution is masterly. Richly entertaining and thoroughly engrossing, Montpensier opens this Friday (4/15) in New York at the IFC Center.